See the latest endorsement from Michael Conway of the Bridgeport (CT) SCORE chapter following a presentation by Stan Simkins to 70 members. Click HERE to download PDF. 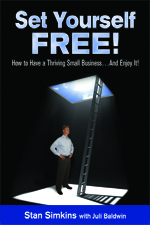 Here are some of the testimonials from small business owners who have already read Set Yourself Free. Click on each video to hear how this book has helped them in their businesses.